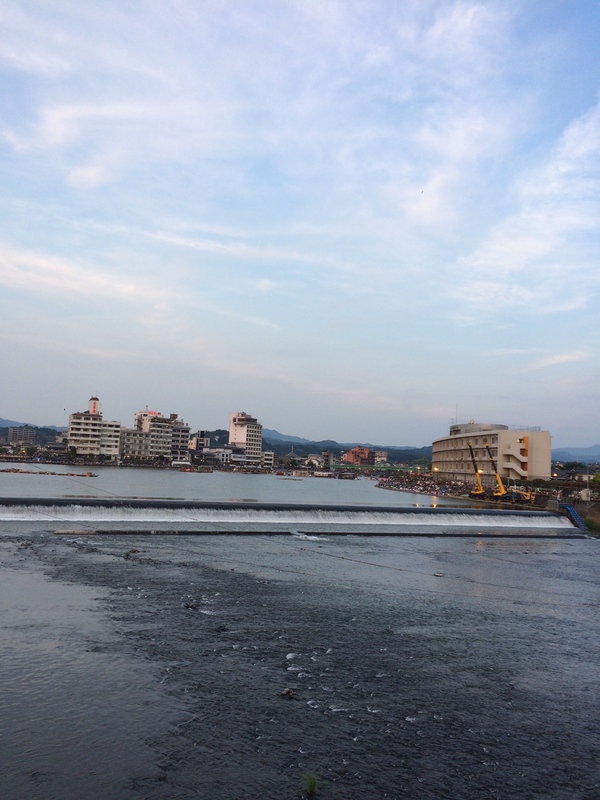 I have been living in Hita city (Oita prefecture) since 3 years ago. 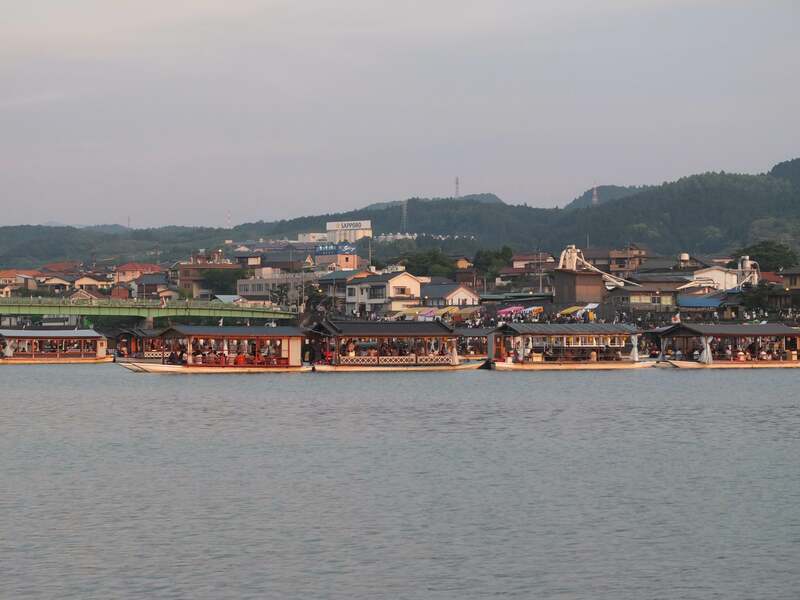 Even though I am not a Japanese, I always look forward to the exciting local event, “Hita River Sightseeing Festival” which is held for two consecutive days on the third weekend of May every year, attracting about 200,000 visitors. I love the well-preserved Japanese traditions, magnificent fireworks, and most importantly, the warm and relaxing ambiance among local people who gather with beloved family and friends, enjoying a quality time altogether. 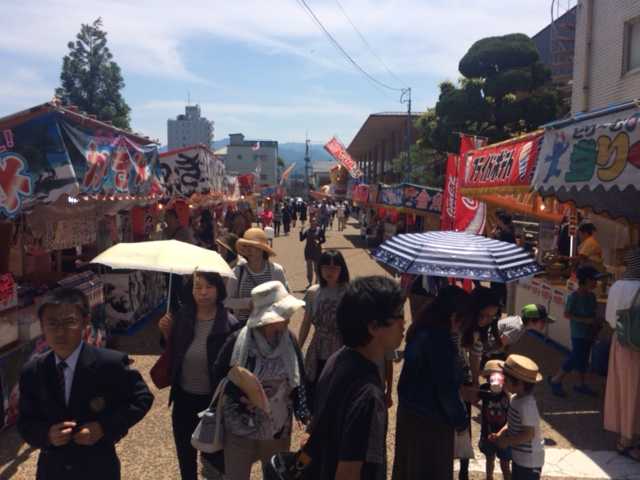 Plus, the festival in May implies summer has come! 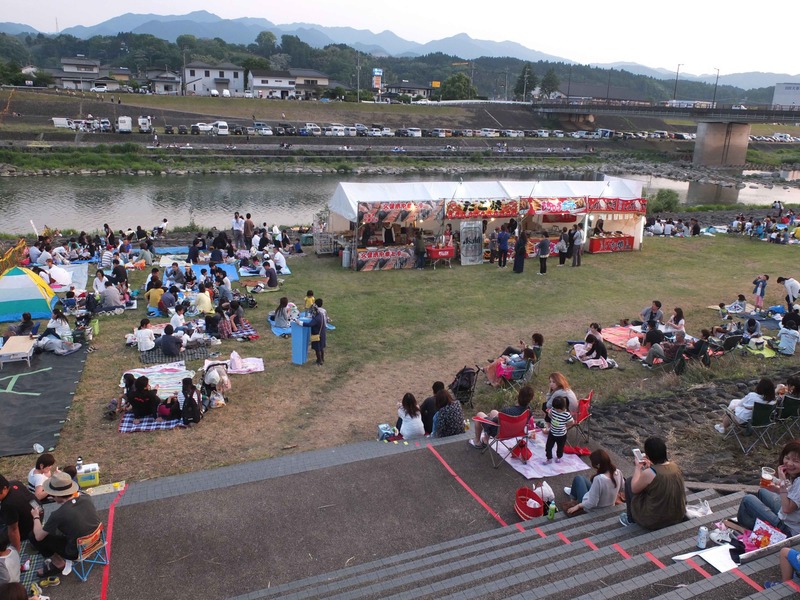 Let’s take a look at the amazing activities and fun in the 70th anniversary of Hita festival. It was a very hot sunny day (over 30 degrees). 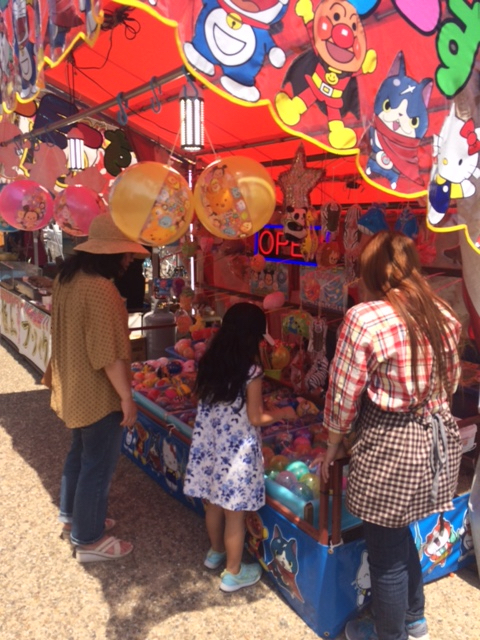 In noon, I started off my festival journey to Hita Central Park, in which a great carnival was being held. I was soon attracted by an array of colorful stands lined there, ranging from various snacks, drinks to games for children. Although my husband and I had finished lunch at home, we couldn’t resist the delicacy temptation. It was not easy to pick because everything looked incredibly delicious (well, all Japanese cuisines are yummy!). I decided to try some “takoyaki” (octopus dumplings) without hesitation because the old men of takoyaki stand worked so hard with immense enthusiasm in which I truly appreciated. 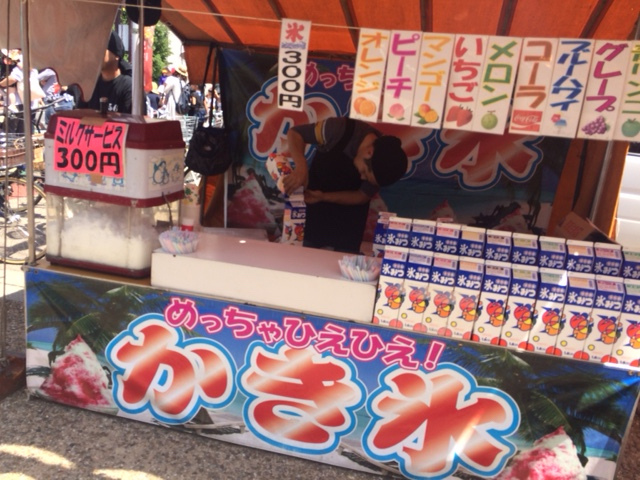 Of course, whenever to go a festival, you definitely need a “kakigoori” (shaved ice topped with syrup) to cool off. I had a melon-flavored kakigoori covered with free extra condensed milk (so tasty!). 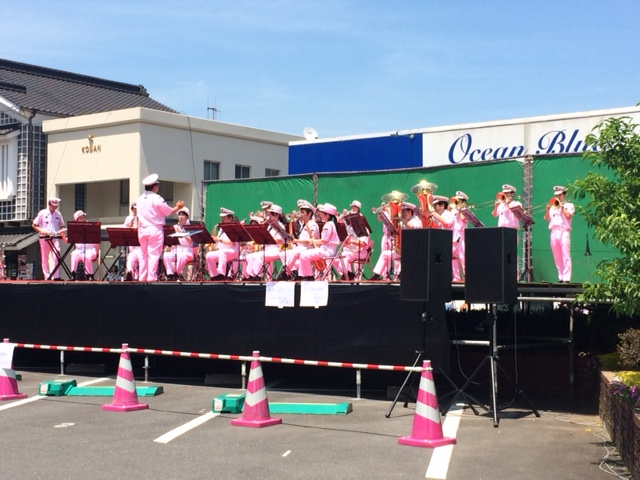 A marvelous performance on an open stage by a local orchestra began at 1 o’clock. However torrid the day was, they were all very professional and gave us a fantastic music show. We audiences broke into rapturous applause. Only if a festival parade took place was the Hita main street flocked with the greatest crowds of people. Perhaps many of them had arrived very early to occupy a favorable space for a good parade view. Some elderly people were so clever to prepare portable chairs and I wondered they might be waiting for their lovely grandchildren to perform in the upcoming parade. A total of 25 local associations joined the parade, comprising of lovely costume show, musical performance, traditional Japanese dancing and so on. I couldn’t help following other people to clap my hands with gratitude because they were incredibly amazing. It was just a few minutes show but I can imagine they must have gone through a very long time to practice everything. 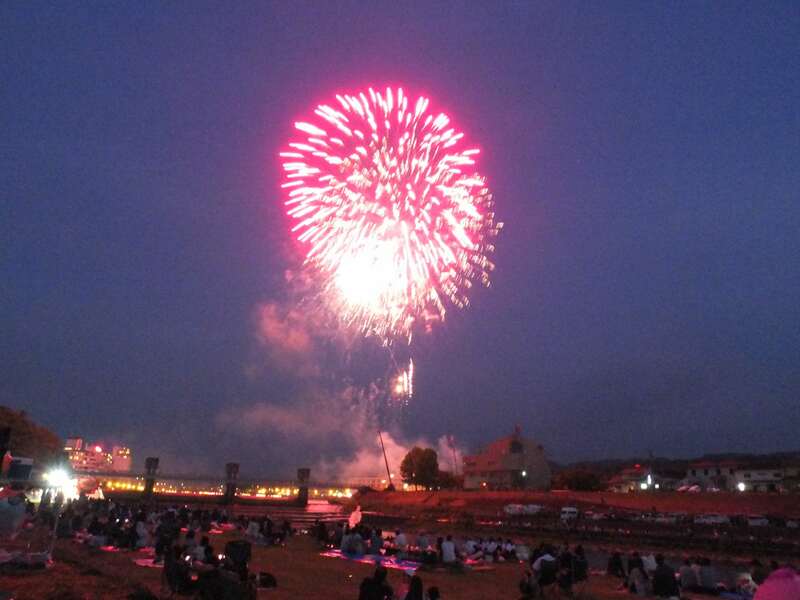 The fireworks program along “Mikumagawa” river at 19:30 – 21:00 was undoubtedly the climax of Hita festival. I believe it was the best fireworks I have ever seen. First, it took about 1.5 hours in which a total of 10000 fireworks were set off. Besides, the distance between the fireworks and audiences was extraordinarily close, enabling everyone to enjoy a spectacular view of the fireworks and be impressed by the huge sounds. Such manificient fireworks were the most signature event of the festival. Speaking of a festival, we always focus on a wide range of standard programs and activities. No doubt, they are all fun. Rather than these, however, I would appreciate the festival as a great opportunity for us to gather with our family and friends. In the past two days, while enjoying the parade or fireworks, I also loved to look at other people around me. No matter who they stayed with (even brought along with their adorable dogs), everyone was showing a very beautiful smile on their faces, savoring the “bentto” (lunch/dinner boxes) as a pleasant picnic altogether. Chat, jokes and laughs emerged among family members. Lovely children run around. Groups of high school boys enjoyed some curry rice, embracing their friendships. Beautiful ladies putting on ”yukata” (traditional Japanese casual kimono for summer) were strolling around or dating with their boyfriends. For me, I also had a wonderful time with my husband who was savoring my home-made “bentto” and saying “oishii”(delicious)! Now, the yearly Hita festival ended and it will definitely come back again next year. But who knows you will be able to join the same event with the same persons by the time of next year? Life is full of uncertainty. A famous Japanese idiom called “Ichigo-ichiei” reminds me to treasure once-in-a-lifetime opportunity. I am so glad I could join the fascinating festival and really enjoyed it. 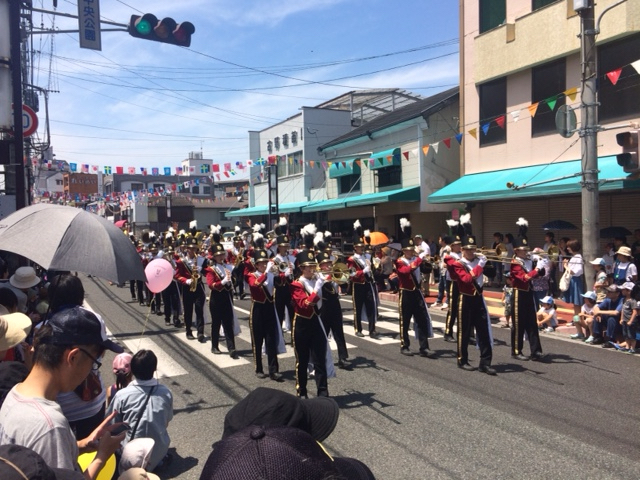 A number of traditional festivals are held in Hita periodically throughout a year. If you are interested in visiting, check out the city’s sightseeing homepage at http://www.en.oidehita.com. You will definitely have a pleasant time here. It takes approximately 1hr 20 mins from Fukuoka Airport to Hita by bus. From Hita JR Station, access “Hita Central Park” by a 10-minute walk. 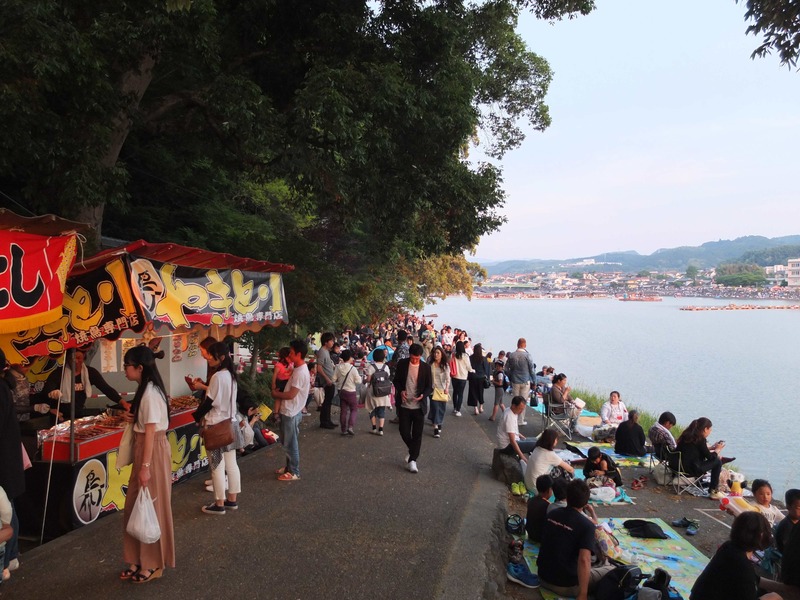 For fireworks, take a shuttle bus to the area along “Mikumagawa River”.